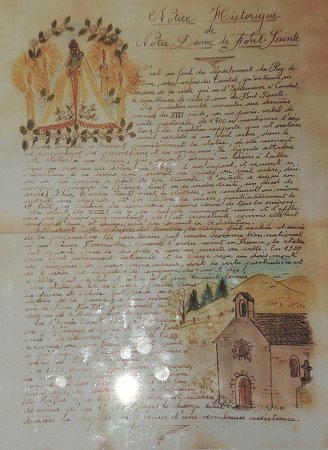 About 15 minutes S of her more famous sister in Vassivière, Puy-de Dome department, Auvergne., in a little road side chapel just outside of town on the road towards Condat. 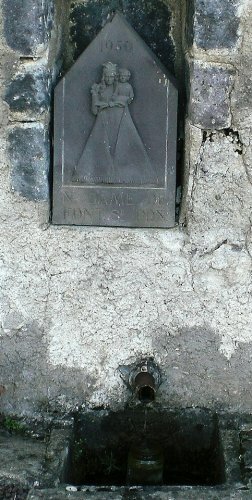 The little wooden statue was stolen in the fall of 2007. 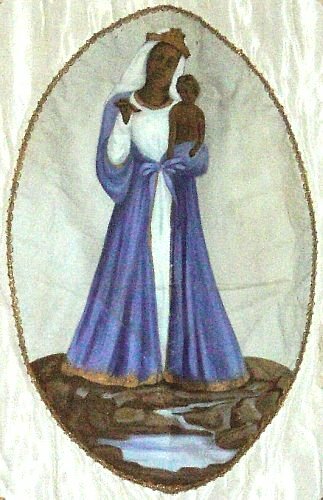 What remains is this beautiful image of her on a banner from 1958 used in processions and the sacred spring with a 1950 little stone copy of the original statue. This Black Madonna's sacred water reputedly heals depression, languor, and apathy. It certainly lifted the spirits of our little group immediately. A hand written 'historic notice' in the chapel tells the story of the place: Some time in the 16th century a shepherd roamed these parts with his sheep. He stopped to rest at the source of fresh water that emerged at the foot of a venerable, old tree. He had sculpted a Virgin and Child out of a piece of Oak and now decided that a hollow in the tree above the spring would be the right place for his statue. The artist signed his work, so to say, with his mark: the Virgin holds a sheep's foot in her right hand. In the 17th century the old tree died and collapsed. That's when the first chapel was built to house Our Lady of Font Sainte. When that structure was near ruin in the 18th century it was replaced by the present chapel, which was inaugurated shortly before the Revolution. Many pilgrims would gather here, especially on the 15th of August, the feast day of the Assumption of Mary into heaven (which is a national holiday in France). During the troubled period following the Revolution the Virgin was hidden and thus saved from profanation. The sanctuary was sold into the private hands of some nobleman. When order returned to France, the statue was placed once more into her chapel, where worship and masses could resume once more. In 1950 the chapel was completely restored and the humble little sanctuary received a great privilege: Pope Pius XII ordained that those who would attend mass here on any feast day of Mary would have all their sins forgiven if they asked for it. It's a humble, but healing spring.